Jagamuni Sujeewa de Soyza alias Kosgoda Suji, Annasi Moril and Kalu Sagara in Tangalle, are well known leading drug dealers in the country (but Police will not arrest them?). The arrest of 40-year-old Samarasinghe Arachchige Madush Lakshitha alias Makandure Madush by the Dubai law enforcement authorities has emerged as the biggest talking point in the country today. 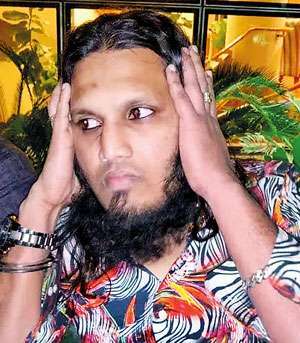 Although he and his gang members as well as his colleagues such as well-known singer Amal Perera were arrested by the Dubai authorities two weeks ago on February 4, it is not known as to who was actually behind the arrest of Makandure Madush — one of Sri Lanka’s most wanted drug dealers. Going through the public statements made by several politicians including President Maithripala Sirisena claiming to be behind the arrest of Madush, there is doubt whether the Sri Lanka Police Department or any other local law enforcement agencies were really behind this major arrest. With the name of the Makandure Madush being linked to several leading high profile criminal activities in the country, the law enforcement authorities in Sri Lanka mainly the Sri Lanka Police, maintained that they were after Makandure Madush and his gang members. Some reports earlier said the Police had launched a secret plan to arrest Makandure Madush who was hiding in Dubai. However, there was no progress as it was not easy when dealing with Dubai. Although the two countries have signed the Extradition Treaty it has not been submitted for ratification by Sri Lanka’s Parliament. So much of narcotics seized: Where do they end up? it is difficult to imagine the law enforcement agencies being unaware as to the identity of the main players or the brains behind this evil. In case they are known, as surely they must be; then they should be named and shamed and subjected to the severest punishment as a deterrent to the next in line waiting on the side-lines for the slightest opportunity to jump into the narcotic bandwagon. Makandure Madush, whose only dream was to become Sri Lanka’s drug kingpin, he had so many enemies in the drug business. Among them were Jagamuni Sujeewa de Soyza alias Kosgoda Suji, Annasi Moril and Kalu Sagara in Tangalle, who were leading drug dealers in the country. Latest information has also revealed that prominent drug dealers in Pakistan, Afghanistan and Iran were after Madush as he had cheated them on several drug smuggling operations. With regard to the latest information available, the arrest of Makandure Madush and his gang members in Dubai was carried out by none other than one of the above mentioned drug dealers including local and foreign drug dealers while neither the Sri Lanka Police nor government officials were in any way aware about the arrest and what went on behind the scenes on the basis that the authorities in Dubai had so far not communicated any information about the arrest of the leading Sri Lankan drug dealer. But it had now been revealed that a Sri Lankan Police Inspector had some months ago provided sufficient evidence for the arrest. (The IP, who was a prominent member of the Special Task Force’s intelligent unit was transferred to the normal Police few months ago and since then had been working under DIG Deshabandu Tennakoon) But the IP alone with his informants had worked independently from Sri Lanka to make the arrest possible. His informants had close links with Kosgoda Suji, Annasi Moril and Kalu Sagara. The whole operation started when, informants had alerted the IP about a grand party that Makandure Madush was organizing to celebrate the birthday of the child of his (Madush’s) mistress, now residing in Dubai. For the party he had invited well-known singer Amal Perera, his son Nadeemal and actor Ryan from Sri Lanka. At that time both Kalu Sagara, Annasi Moril as well as the IP came to know that Makandure Madush had planned to serve even cocaine and other illicit drugs among the invitees. The Dubai Police were alerted about the party using the information — some provided by the foreign drug dealers, Kalu Sagara, who is in Dubai, other drug dealers and the IP from Sri Lanka, . Soon after receiving the tip-off the Dubai law enforcement authorities raided the extravagant party around 4.00 am on February 4 and found some cocaine and other drugs at the scene. During the raid some 31 suspects including Madush, Amal Perera, his son, actor Ryan, drug dealer Imran were taken into custody by the Dubai law enforcement authorities. Four women, including Madush’s mistress were released by the Dubai authorities. So the entire plan to arrest Makandure Madush was clearly the result of a coordinated effort by the Madush’s enimies with the backing of one IP in Sri Lanka. To identify the suspects, the Dubai authorities had sent pictures of suspects taken soon after the arrest to informants in various countries, and these photos were later leaked to the social media. After the arrest of Sri Lanka’s most wanted drug dealer in Dubai, President Maithripala Sirisena had contacted IGP Pujith Jayasundare to get more information about it. It is learned that at that time the Police Chief didn’t know anything about any such development. The IGP had then contacted his DIGs and ordered them to find out the details as soon as possible. When the IGP informed DIG Deshabandu Tennakoon about it, the DIG had alerted the IP to find out about the arrest. It was only then that the IP had informed the DIG that he too played a role in the arrest of Makandure Madush. Within hours, the DIG had taken the IP to the IGP to brief him about the incident and then on Tuesday (5) night, the IP reportedly met the President and briefed him about the operation with evidence proving that he played a key role in the arrest. However, so far Sri Lankan authorities are unable to get any details about the arrest from Dubai. Counsel Shabdika Wellappili, who went to Dubai to represent well-known singer Amal Perera and his son Nadeemal, said the Sri Lankan Consulate in Dubai had rejected a request made by him to make a representation on behalf of the Sri Lankan Government. The Consulate office in Dubai had told the lawyer that about 6,000 Sri Lankans had been sentenced and were in police custody for various offences. “The Dubai Consulate office claimed that, if the Consulate office appears for these two individuals when the investigations are still going on, it would be unfair on the remaining Sri Lankan who were facing charges in the Emirates,” Counsel Wellappili said. He said that the suspects including drug kingpin Makandure Madush, singer Amal Perera and his son Nadeemal were produced in a Dubai Court and remanded till February 28. He told the Dailymirror that he met singer Amal Perera and his son Nadeemal today while in police custody. Counsel Wellappili said the Dubai authorities had informed him that bail applications could be filed to get Amal and Nadeemal released. Meanwhile, since the arrest of Madush in Dubai, Sri Lanka’s law enforcement authorities had launched a countrywide operation to gather information on the assets of the suspects, who were arrested in Dubai. As a result, Police raided Singer Amal Perera’s and actor Ryan’s houses separately and some equipment, used for drug production as well as empty cocaine pouches were seized. Among the arrested suspects, was leading underworld criminal Kanjipaani Imran. He is said be a close confidant of Madush. One time Imran had a small shop at Maligawatte, where he sold soup items. He then worked as the driver of another drug dealer Siddhik. Due to the increase in raids in Sri Lanka several criminals including Imran fled Sri Lanka. Later he had joined a prominent India and Pakistan based underworld criminal mobster and drug dealer Dawood Ibrahim and actively engaged in drug deals with Sri Lanka. In 2015, Makandure Madush illegally migrated to Dubai using a forged passport. Imran was the person who provided accommodation to Madush when he arrived in Dubai. The Madush’s mistress was the widow of Kalu Thushara of Maharagama, who died during the Welikada prison shooting incident. With the death of Kalu Thushara, his widow left for Dubai seeking Madush’s assistance to take revenge of her husband’s death. Accordingly, using Madush, the mistress launched an operation to kill IP Niyomal Rangajeewa of the Police Narcotic division. In Piliyandala they launched the attack killing a police constable and two other civilians. However, Rangajeewa escaped with bullet wounds. Soon after the arrest of Madush in Dubai, his opponents in Sri Lanka reportedly started to hunt down his supporters in Sri Lanka. Accordingly, a 39-year-old woman Asha Faari alias ‘Kudu Chooti’, who is the mistress of underworld figure Kanjipaani Imran, was injured when two unidentified gunmen opened fire at her at Melwatta in Kotahena on Thursday evening. Kudu Chooti, who is engaged in heroin smuggling is currently receiving treatment at the Intensive Care Unit of the Colombo National Hospital. 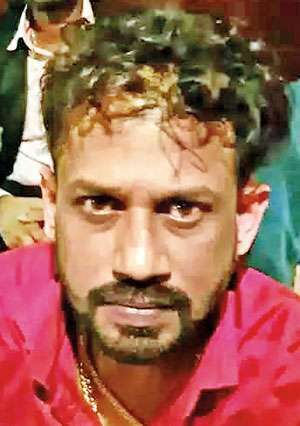 The cold war between Madush and Annasi Moril, who were in hiding in Dubai started, when a Madush’s team pretending as Narcotic officials taken away some 110 kilos of drugs, that were sent by Annasi Moril from Dubai to Sri Lanka. Madush had used another underworld team, which was operating in the Devundara area. After that Kalu Sagara of Angunukolapalassa joined Annasi Moril to take revenge on Madush. Kalu Sagara’s had a vendetta against Madush because of the killing of Kaduwela Samayang, another leading underworld figure, who was brutally murdered by a team sent by Madush. After the killing of Samayang, Madush was planning to kill Kalu Sagara who had murdered Madush’s close colleague Kamburupitiye Harsha. Harsha was killed at Obeysekera Pura when he was with his mistress. Former Chairman of Southern Development Authority Danny Hittatiya was killed in 2006 allegedly by a team led by Kamburupitiye Harsha and Sunil Premaratne alias Attaya on the instructions of Makandure Madush. The CID issued a red notice in connection with this killing for the arrest of Makandure Madush. Since the arrest of Madush, Sri Lankan law enforcement authorities carried out a series of raids and arrested several of Makandure Madush’s accomplices.